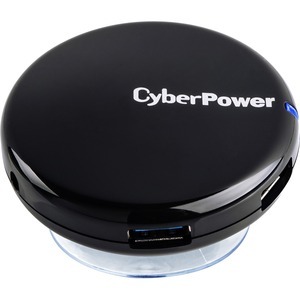 The CyberPower CPH430PB USB 3.0 SuperSpeed Hub with 4 USB ports provides high speed plug and play expansion for 4 USB connected devices using the latest USB 3.0 data transmission speeds up to 5 Gbit/s (tens time faster than USB 2.0). 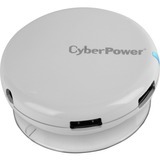 The 3.6A AC power adapter insures sufficient power for attached peripherals. The hub can be mounted on almost any smooth surface using the included suction cup. The CPH430PB is backwards compatible with computers and peripherals that use USB 2.0 data transfer speeds. A Limited Lifetime Warranty ensures that this product has passed our highest quality standards in design, assembly, and material or workmanship.